The thing started in this way. On April the 23rd 1929, Professor Bergen Davis from Columbia University came up and gave a colloquium in this Laboratory, in the old building, and it was very interesting. He told Dr. Whitney, and myself, and a few others something about what he was going to talk about beforehand and he was very enthusiastic about it and he got us interested in it, and well, I�ll show you right on this diagram what kind of thing happened (Fig. 1). Fig. 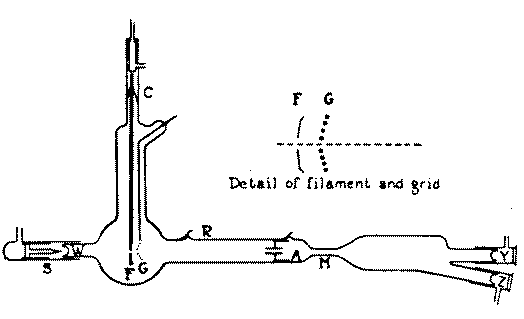 1 Diagram of first experimental tube. S, radio-active source; W, thin glass window; F, filament; G, grid; R, lead to silvered surface; A, second anode; M, magnetic field; C, copper seals; Y, and Z, zinc sulfide screens. He produced a beam of alpha rays from polonium in a vacuum tube. He had a parabolic hot cathode electron emitter with a hole in the middle, and the alpha rays came through it and could be counted by scintillations on a zinc sulfide screen with a microscope over here (Y and Z). The electrons were focused on this plate, so that for a distance there was (p.1) a stream of electrons moving along with the alpha particles. Now you could accelerate the electrons and get them up to the velocity of the alpha particles. To get an electron to move with that velocity takes about 590 volts; so if you put 590 volts here, accelerating the electrons, the electrons would travel along with the alpha particles and the idea of the experiment was that if they moved along together at the same velocity they might recombine so that the alpha particle would lose one of its charges, would pick up an electron, so that instead of being a helium atom with two positive charges it would only have one charge. Well, if an alpha particle with a double charge had one electron, it�s like the Bohr theory of the hydrogen atom, and you know its energy levels. It's just like a hydrogen atom, with a Balmer series, and you can calculate the energy necessary to knock off this electron and so on. Well, what they found, Davis and Barnes, was that if this velocity was made to be the same as that of the alpha particle there was a loss in the number of deflected particles. If there were no electrons, for example, and no magnetic field, all the alpha particles would be collected over here (Y) and they had something of the order of 50 per minute which they counted over here. Now if you put on a magnetic field you could deflect the alpha particles so they go down here (Z). But if they picked up an electron then they would only have half the charge and therefore they would only be deflected half as much and they would not strike the screen. Now the results that they got, or said they got at that time, were very extraordinary. They found that not only did these electrons combine with the alpha particles when the electron velocity was 590 volts, but also at a series of discrete differences of voltage. When the velocity of the electrons was less or more than that velocity by perfectly discrete amounts, then they could also combine. All the results seemed to show that about 80' of them combined. In other words, there was about an 80' change in the current when the conditions were right. Then they found that the velocity differences had to be exactly the velocities that you can calculate from the Bohr theory. In other words, if the electron coming along here happened to be going with a velocity equal to the velocity that it would have if it was in a Bohr orbit, then it will be captured. Of course, that makes a difficulty right away be-cause in the Bohr theory when there is an electron coming in from infinity it has to give up half its energy to settle into the Bohr orbit. Since it must con-serve energy, it has to radiate out, and it radiates out an amount equal to the energy that it has left in the orbit So, if the electron comes in with an amount of energy equal to the amount you are going to end up with, then you have to radiate an amount of energy equal to twice that, which nobody had any evidence for. So there was a little difficulty which never was quite resolved although there were two or three people including some in Germany who worked up theories to account for how that might be. Sommerfeld, for example, in Germany. He worked up a theory to account for how the electron could be captured if it had a velocity equal to what it was going to have after it settled down into the orbit. Well, there were these discrete peaks, each one corresponding to one of the energy levels in the Bohr theory of the helium atom, and nothing else. Those were the only things they recorded. So you had these discrete peaks. Well, how wide were they? Well, they were one hundredth of a volt wide. In other words, you had to have 590 volts. That would give you equal velocities but there were other peaks, and I think the next velocity would be about 325.1 volts. If you had that voltage, then you got beautiful capture. If you didn't, if you changed it by one hundredth of a volt--nothing. It would go right from 80% down to nothing. It was sharp. They were only able to measure to a hundredth of a volt so it was an all-or-none effect. Well, besides this peak at this point, there were ten or twelve different lines in the Balmer series, all of which could be detected, and all of which had an 80% efficiency. (See Fig. 2. ) They almost completely captured all the electrons when you got exactly on the peak. Well, in the discussion, we questioned how, experimentally, you could examine the whole spectrum; because each count, you see, takes a long time. There was a long series of alpha particle counts, that took two minutes at a time, and you had to do it ten or fifteen times and you had to adjust the voltage to a hundredth of a volt. If you have to go through steps of a hundredth of a volt each and to cover all the range from 330 up to 900 volts, you'd have quite a job. (Laughter) Well, they said that they didn't do it quite that way. They had found by some preliminary work that they did check with the Bohr orbit velocities so they knew where to look for them. They found them sometimee not exactly where they expected them but they explored around in that neighborhood and the re-sult was that they got them with extraordinary precision. So high, in fact, that they were sure they'd be able to check the Rydberg constant more accurately (p.2) than it can be done by studying the hydrogen spectrum, which is something like one in 108 At any rate, they had no inhibitions at all as to the accuracy which could be obtained by this method especially since they were measuring these voltages within a hundredth of a volt. Anybody who looks at the setup would be a little doubtful about whether the electrons had velocities that were fixed and definite within 1/100 of a volt because this is not exactly a homogeneous field. The distance was only about 5 mm in which they were moving along together. Well, in his talk, a few other things came out that were very interesting. One was that the percent-age of capture was always around 80%. The curves would come along like this as a function of voltage (Fig. 2). The curve would come along at about 80% and there would be a sharp peak up here and another sharp peak here and, well, all the peaks were about the same height. Well, we asked, how did this depend upon current density? �That's very interesting," he said, "It doesn't depend at all upon current density." We asked, "How much could you change the temperature of the cathode here?" "Oh, yes," he said, "if you check the Richardson equation and calculate, you'll find that you get electrons even at room temperature and those are the one8 that are captured. " He said, "That seemed like quite a great difficulty. But," he said, 'you see it isn't so bad be-cause we now know that the electrons are waves. So the electron doesn't have to be there at all in order to combine with something. Only the waves have to be there and they can be of low intensity and the quantum theory causes all the electrons to pile in at just the right place where they are needed." So he saw no difficulty. And so it went. Well, Dr. Whitney likes the experimental method, and these were experiments, very careful experiments, described in great detail, and the results seemed to be very interesting from a theoretical point of view. So Dr. Whitney suggested that he would like to see these experiments repeated with a geiger counter instead of counting scintillations, and C. W. Hewlett, who was here working on geiger counters, had a setup and it was proposed that we would give him one of these, maybe at a cost of several thousand dollars or so for the whole equipment, so that he could get better data. But I was a little more cautious. I said to Dr. Whitney that before we actually give it to him and just turn it over to him. it would be well to go down and take a look at these experiments and see what they really mean. Well, Hewlett was very much interested and I was interested so only about two days later, after this colloquium, we went down to New York. We went to Davis's Laboratory at Columbia University, end we found that they were very glad to see us, very proud to show us all their results, so we started in early in the morning. We sat in the dark room for half an hour to get our eyes adapted to the darkness so that we could count scintillations. I said, first I would like to see these scintillations with the field on and with the field off. So I looked in and I counted about 50 or 60. Hewlett counted 70, and I counted somewhat lower. On the other hand, we both agreed substantially. What we found was this. These scintillations were quite bright with your eyes adapted, and there was no trouble at all about counting them, when these alpha particles struck the screen. They came along at a rate of about 1 per second. When you put on a magnetic field and deflected them out, the count came down to about 17, which was a pretty high percentage, about 25% background. Barnes was sitting with us, and he said that's probably radioactive contamination of the screen. Then, Barnes counted and he got 230 on the first count and about 200 on the next, and when he put on the field it went down to about 25. Well, Hewlett and I didn't know what that meant but we couldn't see 230. Later, we understood the reason. I had seen, and we discussed a little at that point, that the eyepiece was such that as you looked through, you got some flashes of light which I took to be flashes that were just outside the field of view that would give a diffuse glow that would be perceptible. And you could count them as events. They clearly were not particles that struck the screen where you saw it, but nevertheless, they seemed to give a dif-fuse glow and they came at discrete intervals and you could count those if you wanted. Well, Hewlett counted those too and I didn�t. That accounted for some difference. Well, we didn't bother to check into this, and we went on. Well, I don't want to spend too much time on this experiment. I have a 22-page letter that I wrote about these things and I have a lot o! notes. The gist of it was this. There was a long table at which Barnes was sitting, and he had another table over here where he had an assistant of his named Hull who sat here looking at a big scale voltmeter, or potentiometer really, but it had a scale that went from one to a thousand volts and on that scale that went from one to a thousand, he read hundredths of a volt. (Laughter) He thought he might be able to do a little better than (p.3) that. At any rate, you could interpolate and put down figures, you know. Now the room was dark except for a little light here on which you could read the scale on that meter. And it was dark except for the dial of a clock and he counted scintillations for two minutes. He said he always counted for two minutes. Actually, I had a stop watch and I checked him up. They sometimes were as low as one minute and ten seconds and sometimes one minute and fifty-five seconds but he counted them all as two minutes, and yet the results were of high accuracy! Well, we made various suggestions. One was to turn off the voltage entirely. Well, then Barnes got some low values around 20 or 30, or sometimes as high as 50. Then to get the conditions on a peak he adjusted the voltage to two hundred and --, well some of those readings are interesting; 325.01. That's the figure I put down, and there he got only a reading of 52, whereas before when he was on the peak, he got about . He didn't like that very much 80 he tried changing this to .02; a change of one hundredth of a volt. And there he got 48. Then he went in between. (Laughter) They fell off, you see, so he tried 325.015 and then he got 107. So that was a peak. Then we had lunch. We sat for half an hour in the dark room so as not to spoil our eyes and then we had some readings at zero volts and then we went back to 325.03. We changed by one hundredth of a volt and there he got 110. And now he got two or three readings at 110. And then I played a dirty trick. I wrote out on a card of paper 10 different sequences of V and 0. I meant to put on a certain voltage and then take it off again. Later I realized that that wasn't quite right because when Hull took off the voltage, he sat back in his chair--there was nothing to regulate at zero, so he didn't. Well, of course, Barnes saw him whenever he sat back in his chair. Although, the light wasn't very bright, he could see whether he was sitting back in his chair or not so he knew the voltage wasn't on and the result was that he got a corresponding result. So later I whispered, "Don't let him know that you're not reading," and I asked him to change the voltage from 325 down to 320 so he'd have something to regulate and I said, "Regulate it just as carefully as if you were sitting on a peak." So he played the part from that time on, and from that time on Barnes' readings had nothing whatever to do with the voltages that were applied. Whether the voltage was at one value or another didn't make the slightest difference. After that he took twelve readings, of which about half of them were right and the other half were wrong, which was about what you would expect out of two sets of values. I said, "You�re through. You're not measuring anything at all. You never have measured anything at all. " �Well," he said, "the tube was gassy. (Laughter) The temperature has changed and therefore the nickel plates must have deformed themselves so that the electrodes are no longer lined up properly." "Oh, yes,� he said, "but we always made blanks to check ourselves, with and without the voltage on." He immediately--without giving any thought to it--he immediately had an excuse. He had a reason for not paying any attention to any wrong results. It just was built into him. He just had worked that way all along and always would. There is no question but what he is honest; he believed these things, absolutely. Hewlett stayed there and continued to work with him for quite a while and I went in and talked it over with Davis and he was simply dumbfounded. He couldn't believe a word of it. He said, "It absolutely can't be," he said. "Look at the way we found those peaks before we knew anything about the Bohr theory. We took those values and calculated them up and they checked exactly. Later on, after we got confirmation, in order to save time, to see whether the peaks were there we would calculate ahead of time." He was so sure from the whole history of the thing that it was utterly impossible that there never had been any measurements at all that he just wouldn't believe it. Well, he had just read a paper before the Research Laboratory at Schenectady, and he was going to read the paper the following Saturday before the National Academy of Sciences; which he did, end gave the whole paper. And he wrote me that he was going to do so on the 24th. I wrote to him on the day after I got back. Our letters crossed in the mails and he said that he had been thinking over the various things that I had told him, and his confidence wasn't shaken, so he went ahead and presented the paper before the National Academy of Sciences.